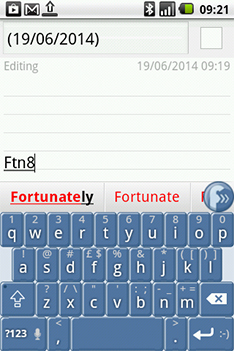 Flexpansion makes touchscreen typing a breeze; professional-level word prediction to help you type faster than ever. It does all the standard things you expect - word completion, next-word prediction, autocorrect, but uniquely also expands any shorthand you care to type - all of this with no prior training required of you or it. You can reduce your typing by up to 70% and it is especially powerful with specialised language as used by doctors, lawyers, and indeed any area with its own terminology. Over time, Flexpansion rapidly learns your personal writing style and improves the quality of its suggestions. A host of features save you time typing including swipe-to-undo, shift-swipe-to-move-around, and long-press for quick access to extras. Flexpansion will also learn from your Gmail. Flexpansion guesses what you're typing - and what you're about to type - by recognising patterns of letters and words. Firstly, it will autocomplete words from just the first few letters. Secondly, its unique 'turbo mode' converts 'txt msg spk' into its full form. Flexpansion is the only app of its kind that lets you use phonetic shortcuts. Flexpansion is available as a free download from Google Play. If your device can't access Google Play, you can also download the free app here.